Alimony is the least predictable aspect of divorce. Judges have wide latitude in determining whether financial support is merited in your case. Even with our experience as divorce attorneys, we cannot say for sure whether alimony will be awarded or its amount and duration. However, we can give a fair idea based on your circumstances, and help you plan for whichever way the court may rule or assist you in resolving the issue by agreement. The law holds that both parties contributed to the marital estate, and that it is not fair for one party to enjoy the same lifestyle after divorce while the other struggles to make ends meet. The court’s decision that one party should pay alimony to the other is based on two primary factors: one party’s need for financial assistance and the other’s ability to pay. Alimony can be awarded to either a husband or a wife. The judge has considerable discretion in awarding spousal support. The primary criteria are disproportionate incomes (e.g., he’s an executive, she’s a clerical worker) and length of the marriage, but there are other considerations. Alimony is rarely awarded in shorter marriages of 7 years or less but is commonly awarded in marriages of 17 years or more. Marriages in the “gray area” between are the hardest to predict. Other criteria the court will consider are the requesting party’s age and health, education and earning capacity, and contributions to the marriage and child-rearing. Durational alimony – intended for “economic assistance” for a specific period of time, not to exceed the length of the marriage, but can be for a shorter period of time. Permanent alimony — until death or remarriage to meet the needs and necessities of life as established during the marriage. 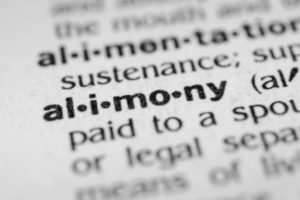 Will alimony be awarded in your divorce? We will give you an honest legal opinion, and vigorously state your case to the judge, but ultimately the court decides unless the parties otherwise agree. For more information, schedule a free consultation at our Jacksonville office. Despite language in an antenuptial agreement (commonly known as a “Prenup”), or in a post-nuptial ageement for that matter, where one party has agreed to be awarded no alimony or assistance with attorney’s fees in the event of a dissolution of marriage or separation, the Court DOES have the power to award alimony or attorney’s fees on a temporary basis while such an action is pending. While most attorneys will require a retainer prior to taking any case, it is important to know that you can still request financial assistance for both household bills and other needs, as well as reimbursement or assitance with future attorney’s fees (and court costs), during the pendency of your divorce or action for alimoy connected with a divorce (separation needs), despite having waived the right to financial assistance in a pre or post nuptial agreement! The Law Office of Summer R. Nichols is experienced with handling this exact situation and is ready to represent you and assert your rights under Florida law. Beware that if you are a payor spouse, lump sum alimony, unlike other types of alimony, is NOT tax deductible to you. If your tax consequence would be huge, consider a different alimony scheme!